Lkmediabook - Liefde by die Dam at Emmarentia Dam 5 August 2018. Liefde by die Dam at Emmarentia Dam 5 August 2018. Another JacarandaFM More Music You Love Experience. Die Heuwels Fantasties, Karlien van Jaarsveld, Francois van Coke, Koos Kombuis, Elvis Blue, Bongeziwe Mabandla, Bouwer Bosch, Martin Bester and MC Schalk Bezuidenhout. 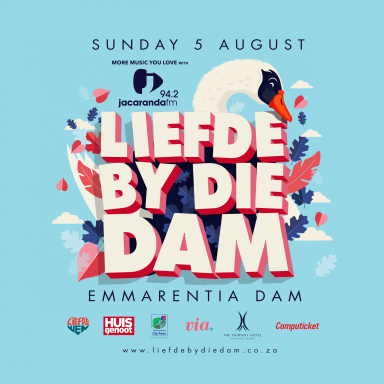 Join some of SA`s top artists for the annual Liefde by die Dam Concert at Emmarentia Dam on Sunday August 5th. Liefde by die Dam, named after Valiant Swart's famous hit song with the same name, strives to serve as a platform to showcase the best local music. The program features music for young and old, which makes it an ideal day out with your family or ‘besties’. In partnership with Jacaranda FM, more music you love. The line-up for this year`s event includes Die Heuwels Fantasties, Karlien van Jaarsveld, Francois van Coke, Koos Kombuis, Elvis Blue, Bongeziwe Mabandla, Martin Bester and Bouwer Bosch. The MC will be the popular Afrikaans comedian Schalk Bezuidenhout. Die Heuwels Fantasties, Karlien van Jaarsveld, Francois van Coke, Bouwer Bosch and Elvis Blue have all been making headlines in the past few years with the release of new singles and albums and they have collectively won numerous prestigious local music awards. Add to this already impressive line-up, one of SA`s most influential singers, the legendary Koos Kombuis, the captivating new face of Afro-Folk Bongeziwe Mabandla, as well as the very popular Jacaranda FM presenter and singer Martin Bester, and the stage is set for a fantastic, memorable concert. 13:30 - Karlien van Jaarsveld. For your day out at the dam there will be a delicious range of South Africa’s best artisan food traders. You can also bring your own picnic baskets. Adults R165 / Kids 12 years and younger: R75 / Kids under 3: Free entry.